Vegetarian Zen is creating inspiring podcasts! We are Vickie (on the left) and Larissa and we live in San Antonio, Texas with our family: three spoiled rotten cats named Jake Ryan, Samantha Baker, and Idgie Threadgoode, and one rambunctious pup, Cosmo Kramer (who totally lives up to his namesake). Vegetarian Zen is now and has always been a labor of love for us. We started the podcast and website on a shoestring budget, all on our own. Since we launched, we've seen the impact we have been able to make with our podcast. It is doing exactly as we intended: providing a safe and friendly community where vegetarians, vegans, and the veg-curious can come for support, recipes, and friendship. We would love to be able to grow Vegetarian Zen so we can reach and help more people. We're super-busy developing resources to do this...videos, webinars, ebooks, and downloadable guides are some of the things we're considering. To do these things effectively will take some time and money. And that's where you, our wonderful and loyal Veg Zenners, come in! Just a little financial support from our awesome community will help to alleviate some of the costs of podcasting (monthly media hosting fees, yearly website hosting fees, etc) and will free up some of our resources to develop new Vegetarian Zen offerings for you. I'd like to make a one-time donation to Vegetarian Zen! Thank you, as always, for continuing to listen and for being a part of our community. If you're ever in San Antonio, let's meet up for a yummy veg meal! Please Note: If your pledge level qualifies you to receive a physical reward (sticker, magnet, bag, or t-shirt), we ask that you allow up to 6 weeks for delivery (due to production times on some items). We will, of course, make every attempt to get your rewards to you as soon as possible!! Thanks. 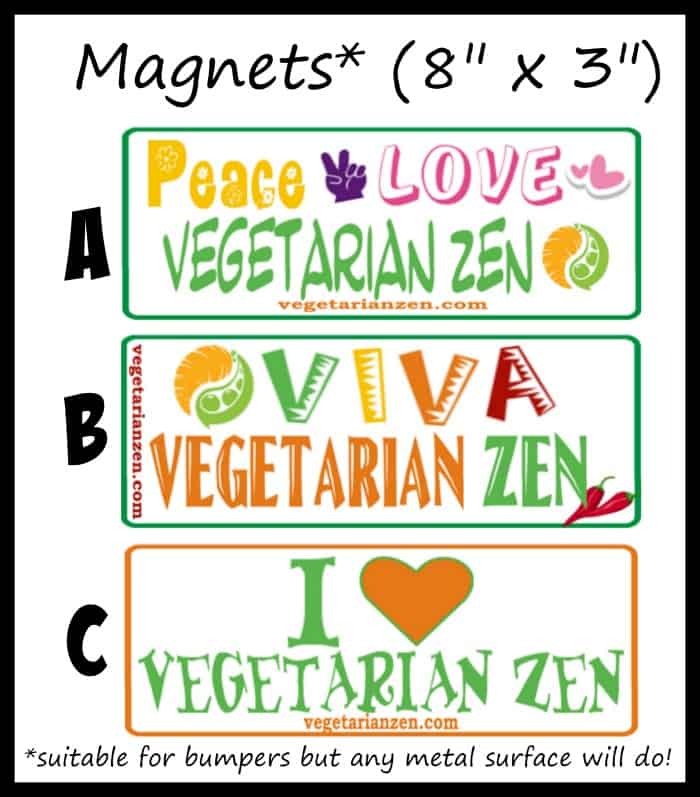 A cool sticker that'll let everyone know you "get your VEG on with Vegetarian Zen!" *Once we receive notification of your pledge, we'll contact you to find out which magnet design you would like. 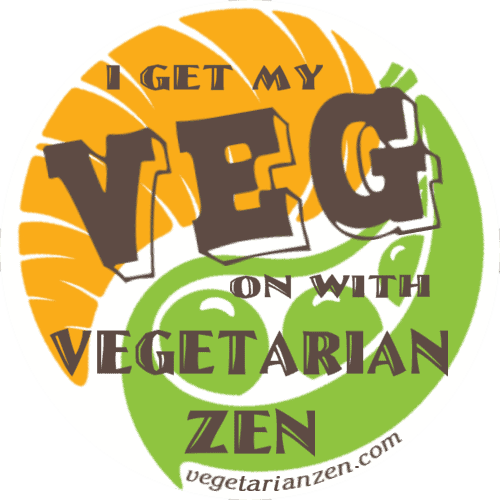 An official Vegetarian Zen t-shirt! When you wear it, everyone will know that you're ready to GET YOUR VEG ON! It costs us $20 per month to host our podcast media files on Libsyn. Reaching $240 will mean that our patrons have funded one year's worth of media hosting! As a special thank you we will create a video personally inducting all of our current patrons into the Golden Apple Roundtable, our Patrons Circle. This video may or may not include costumes, accents, and other shenanigans (and if goblets of wine are involved, possibly singing).